In October, 1753, George Washington, just 21 years old, volunteered for a mission into the upper Ohio River Valley (now western Pennsylvania). 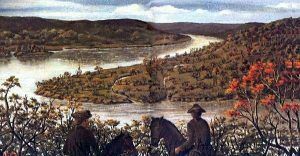 Both the British and French sought control of the Ohio River Valley — the vast territory along the Ohio River between the Appalachian Mountains and the Mississippi River — for economic gain. Virginia governor Robert Dinwiddie sent Washington with a letter to the French who had just built two forts in the region. Dinwiddie’s letter demanded that the French leave. Captain Jacques Legardeur de Sainte-Pierre, the French commander who received the letter, refused. Washington returned to Virginia to give Governor Dinwiddie the news. In early January, 1754, prior to Washington’s return, Dinwiddie had sent a force of soldiers to build a fort at the forks of the Ohio River, where the Allegheny and Monongahela Rivers meet to form the Ohio River (now Pittsburgh, Pennsylvania). Before the fort was completed, French soldiers drove the British off and built Fort Duquesne on the site. In April, Washington, now a lieutenant colonel in the Colonial Virginia Army, was sent on another expedition into the Ohio River Valley, this time to build a road into the area and then help defend the British fort. Finding that the French had seized control, Washington continued to build the road and awaited further instructions. On May 24, 1754, Washington and the Virginia troops arrived in an area called the Great Meadows and set up camp. Shortly after, Washington received a message from a Seneca leader known as the Half King informing him that a group of French soldiers was camped nearby. Washington and 40 of his men set out to find the French. Early in the morning, Washington and his American Indian allies surrounded the French. A skirmish broke out and 15 minutes later the French surrendered. The Half King spoke to the wounded French leader, Ensign Joseph Coulon de Jumonville, and then killed him with his tomahawk. One French soldier escaped to carry the news back to the French Fort Duquesne. 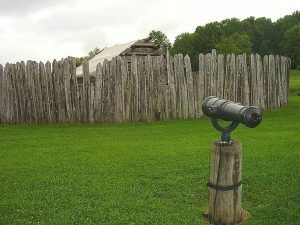 Washington, fearing a large-scale counterattack, decided to fortify his position in the Great Meadows by building a circular palisaded fort, which he named Fort Necessity. On July 3, 1754, the French and their Indian allies approached the fort and a battle ensued. Both sides suffered losses, but the British situation was worse and that night they surrendered. After the British troops withdrew, the French burned the fort and returned to Fort Duquesne. 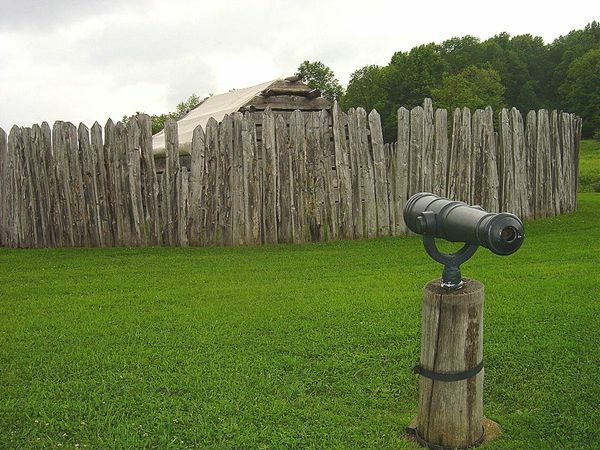 Fort Necessity was significant on many levels. It was the scene of the first major event in George Washington’s military career, and was the only time he surrendered to an enemy. 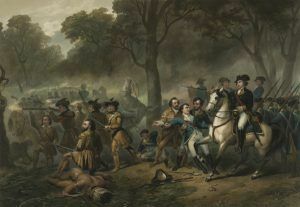 On a global level, the battle at Fort Necessity had profound consequences for the future of Britain’s American colonies — it was the beginning of the French and Indian War in North America, commonly known in Europe as the Seven Years War. The French and Indian War set the stage for the American Revolution and was a landmark event in the European struggle for empire. While the treaty that ended the war won the British a vast amount of land in North America, the cost of war drove the country deep into debt. In order to manage and defend the new North American territory, British soldiers occupied former French forts. To help cover the cost of the soldiers stationed in North America, the British imposed a series of taxes on the colonists. These taxes sparked complaints about “taxation without representation” reviving long-standing resentments. During the French and Indian War, the American colonists resented threats by the British commander, Lord Loudoun. Soldiers often received poor treatment from British officers. At the end of the war, new policies, including the Royal Proclamation of 1763, and new taxes angered the colonists. The “Join or Die” snake flag, designed by Benjamin Franklin in 1754 as a way of rallying the colonists to work together during the French and Indian War, gained new popularity as tensions between the colonies and the mother country increased. Two effects of the French and Indian War became evident as hostilities escalated. First, American officers and soldiers had gained military experience and knowledge during the war. George Washington had clearly learned many important lessons and developed military leadership skills. The American colonists now knew that the British army was not invincible. Second, France was very upset about losing the French and Indian War. Their desire for revenge influenced France’s decision to ally with the Americans during the American Revolution; French aid was instrumental in the American defeat of the British. Taxes put into place through the Sugar Act of 1764 and the Stamp Act of 1765 met with colonial boycotts of taxed items, a successful tactic that led Parliament to repeal both acts. In Boston, the patriot exasperation with Britain’s taxation had been worsened by the presence of British troops occupying the city.